Modern Williamsburg rises along the East River. Of all the ways to enter Brooklyn, the most authentically Jewish might be the same way many of our ancestors did a century ago: crossing the East River by bridge. ​Hundreds of New Yorkers still do it every day by car, train, bike and on foot. But when the Williamsburg Bridge opened in 1903, those suspension cables—the longest such span on the planet at the time—initiated a Jewish migration from the Lower East Side’s crowded tenements to the wide-open, tree-lined boulevards of Brooklyn. ​A century later, the borough’s Jewish diversity is both a boon and a challenge for the traveler. There is no one Jewish neighborhood to visit, no single historic synagogue or cemetery, no major Holocaust memorial or Jewish museum. Jewish Brooklyn is, more than ever, a collection of local experiences. ​Crossing the Williamsburg Bridge is one such adventure. As the J and M trains rumble by and commuter ferries sail the East River below, the skyline of modern Brooklyn comes into view—glittering towers rising over landmarks of yesteryear, like the Domino Sugar Refinery. Frieda Vizel leads tours through hasidic neighborhoods. Along with Williamsburg, the Hasidic areas of Borough Park and Crown Heights constitute the most visibly Jewish districts, with plenty of kosher markets, Judaica shops, synagogues and yeshivas. But what may at first appear to be similar communities are in reality vastly different. ​In Crown Heights, visible tributes to the Rebbe—Rabbi Menachem Mendel Schneerson, who died in 1994 and is still revered by some of his followers as the messiah—are commonplace. The Chabad-Lubavitch movement, headquartered at 770 Eastern Parkway, embraces global travel and modern technology, a departure from other Hasidic sects. ​With emissaries posted in 92 foreign countries as well as across the United States coming and going, the movement’s cosmopolitanism is reflected in a burgeoning restaurant scene. 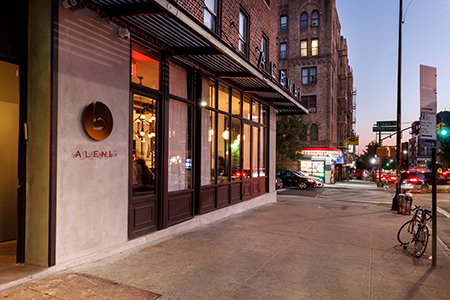 Stylish new boîtes—all strictly kosher, of course—have popped up across Crown Heights. ALENbi, for example, is a modern Israeli eatery where the walls are subway tile and entrées feature ingredients such as freekeh and lemon dust. ​“It’s hard to tell Hasids from hipsters now,” commented Danny Branover, a Soviet-born Israeli Lubavitcher who owns several upscale kosher eateries in Crown Heights. When he opened Basil, an Italian dairy restaurant, in 2010 on “the wrong side of Eastern Parkway,” as he put it, doubters said he’d never fill the tables. Now Basil is packed nightly, while a crop of young, elite chefs draws foodies from across New York to hot spots like Izzy’s BBQ Smokehouse and Boeuf & Bun. 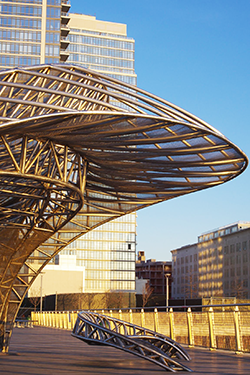 ​A stroll down Eastern Parkway leads to the hub of the borough itself, Prospect Park. Both park and parkway were designed in lavish style by the team responsible for Manhattan’s Central Park, Frederick Law Olmstead and Calvert Vaux. When it was built in the 1870s, Eastern Parkway was considered both a Main Street as well as a template for the kind of ambitious boulevards that befit a modern city. 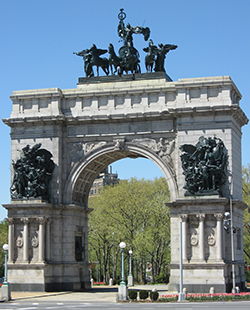 ​The parkway meets Prospect Park at the cultural heart of Brooklyn: Grand Army Plaza, where the Soldiers’ and Sailors’ Arch looms over the Brooklyn Public Library’s flagship branch and the classical façade of the Brooklyn Museum. ​Park Slope, perhaps Brooklyn’s most photogenic neighborhood, sprawls along a gentle hill west of the park. Here you can stroll under a canopy of trees along blocks of 19th-century brownstones, or explore the cafés, bars and boutiques that make Seventh and Fifth Avenues two of Brooklyn’s liveliest streets. ​South of the park, row houses give way to gracious blocks of Victorian houses and tidy lawns. The polyglot Jewish communities of Flatbush, Midwood and Borough Park mingle along the commercial Avenues J and M.
​The shopping corridor along Coney Island Avenue, which bustles with activity during the week, is locked up tight for Shabbat. All the action takes place further south—along the boardwalk at Brighton Beach, known popularly as Little Odessa for its large Russian Jewish community. ​On sunny weekend mornings, there’s a bottle of vodka on every table at venerable cafés like Tatiana, where Russian families share platters of herring and sturgeon. By night, the party moves inside; Tatiana is among several local nightclubs to offer a Vegas-meets-Minsk-style dinner show, with (non-kosher) food presented nearly as theatrically as the sequined dancers. ​Coney Island is the most tourist friendly of South Brooklyn’s waterfronts, but Brighton Beach has more Jewish soul. Virtually year-round, you can join hardy Russians for a dip in the surf, a stroll on the boardwalk or a shopping expedition through the Russian bookstores, shashlik grills and Caucasus bakeries that line Brighton Beach Avenue. “A tour of Jewish Brooklyn could easily be a food tour,” opined Ilana Abramovitch, co-editor with Seán Galvin of the definitive history Jews of Brooklyn . Indeed, while most cities have at best one or two kosher eateries, Brooklyn’s culinary scene is so diverse that you can literally taste the evolution of local Jewish culture in its dining rooms. Among Brooklyn’s Jewish neighborhoods, Hasidic Williamsburg is the most traditional, which is reflected on the menu at glatt-kosher landmark Gottlieb’s. These are dishes your grandmother made—and no fewer than six varieties of kugel. The kosher foodie revolution, meanwhile, is centered in bustling Crown Heights. At ALENbi, Jerusalem-born Yuda Schlass and his partner, Elior Balbul, elevate Israeli cuisine to a new level of refinement. Nearby, Izzy’s BBQ Smokehouse is regularly lauded as the best kosher barbecue in town. Boeuf & Bun is a great place to grab an artisanal burger. In the borough’s more secular precincts, meanwhile, a renaissance of classic Jewish deli fare (most of which is not kosher) is winning over sophisticated diners. When Mile End Deli opened in Boerum Hill in 2010, it kicked off a craze for Montréal-style Jewish food, including smoked meat. Mile End’s recent expansion to Manhattan—and the first Brooklyn outpost of Katz’s Delicatessen, the Lower East Side fixture, inside the DeKalb food hall—are further evidence of the trend. Leonard Bernstein’s grave at Green-Wood Cemetery. In 2016, a pair of millennial New Yorkers, Zach and Alex Frankel, opened Frankel’s Delicatessen in gentrifying Greenpoint. With the slogan “You don’t have to be Jewish to love Frankel’s,” a wry (rye?) twist on the old Levy’s bread ad, the non-kosher deli wins raves for its smoked fish and hand-cut pastrami. Tatiana, a Brighton Beach institution, serves classics like borscht and caviar. The menu makes a point of not listing prices, saying only that it’s expensive, and you should call if you’re curious. Brooklyn is home to several factories that produce shmurah matzah, the Passover staple distinguished from everyday Manischewitz by a near-obsessive level of rabbinic supervision (shmurah means watched).For a peek at the 18-minute process, along with tasty souvenirs, visit the Lubavitch Matzah Bakery (718-778-7914) in Crown Heights. A guided tour offers illuminating context for your visit to the Hasidic neighborhoods of Crown Heights, Borough Park or Williamsburg. Visit Hasidim is run by ex-Hasids Frieda Vizel and Yoelish Steinberg, who decode Yiddish and the semiotics of headgear for small tour groups. 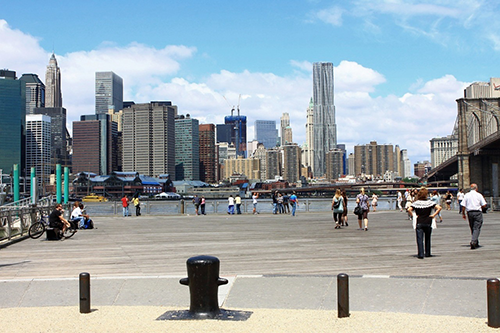 The Brooklyn Heights Promenade offers a stunning, wide-angle view of the Manhattan skyline. A new generation of Jews has reclaimed the post-industrial waterfront from the Heights up through Dumbo, frolicking on the lawns, beaches and walkways of neighboring Brooklyn Bridge Park. Prospect Park—the namesake of adjacent Park Slope—is a lush, landscaped playground with a vintage boathouse, a zoo and the Prospect Park Bandshell for summer concerts. Japanese gardens and fairy-tale footbridges are just some of the attractions at the Brooklyn Botanic Garden inside the park. A block off the park, the neat brownstones of Eighth Avenue are punctuated by an imposing neo-Classical style temple: Reform Congregation Beth Elohim. The 1909 domed structure, with its soaring stained-glass windows, is a historic landmark (old timers call it “Garfield Temple,” a reference to the cross street). Before there was Prospect Park, Green-Wood Cemetery, a National Historic Register site from 1838, helped create the vogue for landscaped public spaces. 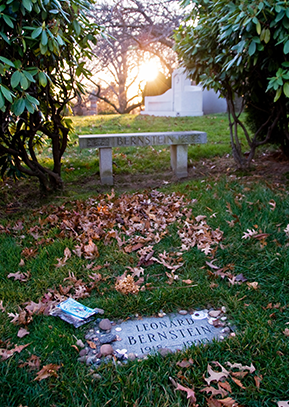 Plenty of notable Jews are buried amid the 478 acres of shady lawns and ornate statuary, including Leonard Bernstein. The Jewish Children’s Museum in Crown Heights, a Chabad-run institution aimed at the broader public, is an interactive introduction to the basics of Jewish life—from holidays and Bible stories to a kid-sized kosher supermarket and kitchen. 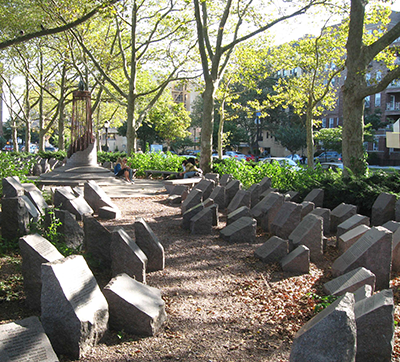 Holocaust Memorial Park, on the canal at Sheepshead Bay, was the city’s first permanent Holocaust tribute at its unveiling in 1985. Today, in a neighborhood still populated by survivors and Soviet émigrés, its benches provide an oasis for reflection overlooking swans and sailboats. The Brighton Beach Boardwalk, along the Atlantic Ocean, is a beloved spot for café-going, people-watching, strolling by the sea and swimming. Pro tip: The surf at Brighton Beach is far gentler than at the Rockaways. Hilary Danailova, a freelance writer now based in Philadelphia, was the third generation of her family to live in Brooklyn.